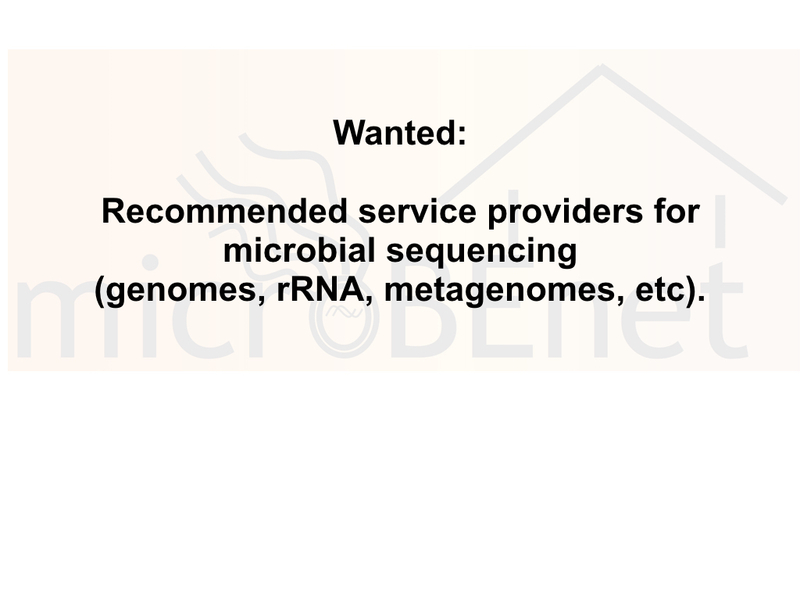 Wanted – recommended service providers for microbial sequencing (genomes, rRNA, metagenomes, etc) – microBEnet: the microbiology of the Built Environment network. In January 2014 I wrote this post about “microbiome” sequencing services. I have gotten many outside requests for the following information — what places (companies, Universities, government agencies, etc) provide contract services for rRNA PCR and sequencing? Source: Request — Information on Places that do rRNA sequencing as a service — microBEnet: the microbiology of the Built Environment network. I am writing this new post to solicit information on this topic again. If you have any recommendations for places that do some type of microbiome or microbe focused sequencing as a service, please post the information here. I will compile the answers and add them to this post.